Since falling out of love with Simon Le Bon in 1986, I’ve never considered myself to be much a ‘fan’ of anything or anyone. Joining a fan club, following an idol or developing a slavish devotion to something usually involves both financial outlay, travel or inconvenience. None of which I care for. But … I’ve seen the light now. I’m a born again evangelical filled with missionary zeal. A fan – burning with desire to tell and sundry about the object of my affection. This particular Halifax-based theatre company have this knack of keeping you pinned to your seat. Even – and especially – when it comes to one of their Shakespeare performances. 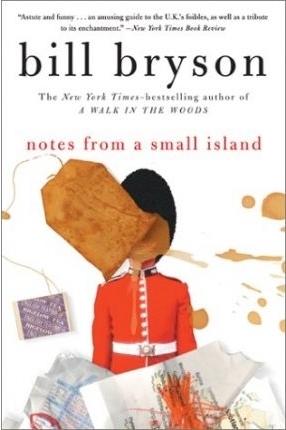 Because let’s face it, much as we’d all love to aspire to be a Bard-freak, the dude from Stratford isn’t always the most readily accessible of writers – especially to those of us who are more au fait with text-speak than with the iambic pentameter. And this is why Northern Broadsides have proved themselves to be wonders of the world of words. You don’t need to have a degree, to be a Guardian reader, to be bessies with Boris Johnson, to have had an inordinately patient English O Level teacher (cheers though, Mrs Fidler) in order to be utterly spellbound; catapulted into the 17th century – because this theatre company do all of the legwork for you. Established in 1992 by artistic director Barrie Rutter OBE and aiming at ‘a distinctive northern voice’ the company tour the land with productions both classical and new – but always with one eye on making the patter of dialogue and complex storylines more accessible to those of us who are a bit shakier with the likes of Shakespeare. Barry Rutter himself plays the greasy, ageing wannabe-philanderer Sir John Falstaff. And inevitably, he steals the show. 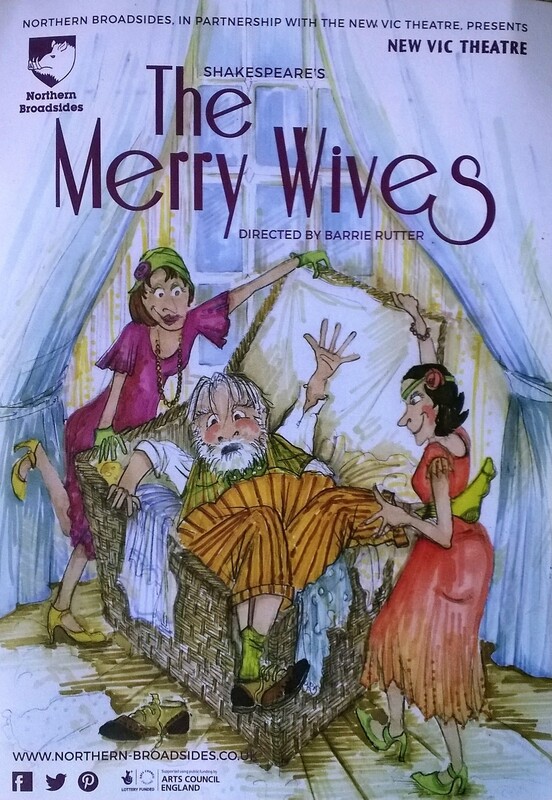 Closely followed by a sparkling double act of the Merry Wives themselves, played by Becky Hindley and Nicola Sanderson. The duo beautifully brought to life the Bard’s quite feminist intention of celebrating middle-aged women as being the stars in society; capable of being warm, witty and wise. I hopped back onto the road back home and located the equivalent of what (for many) would be a cold shower. Or a shot in rehab. What exactly am I referring to here? Well. Some people call them ‘charity’ or ‘second hand’ stores … but my kids call them ‘treasure shops.’ And normally I utterly, one hundred per cent adore them. I would live in the damned things if the men in the white coats would let me. But this particular one happened to take the edge of my getting flash with the cash afternoon. WOMAN ON TILL: Oooh you’ve got your arms full there, love. Let’s tot that up for you. (Counts items out). Oooh – have you got a budgie? ME: Yes. (slightly defensively.) Why? WOMAN: Because you’ve just bought ten little budgie toys here. ME: I suppose some might think that… but – look (waving random tinkly ball thing at her) See? There’s no old budgie poo on it. I’ve checked all of them. WOMAN: No, we always clean everything here. Doesn’t it bother you though? That it could have belonged to a dead budgie? ME: Well, it must be dead. Surely. 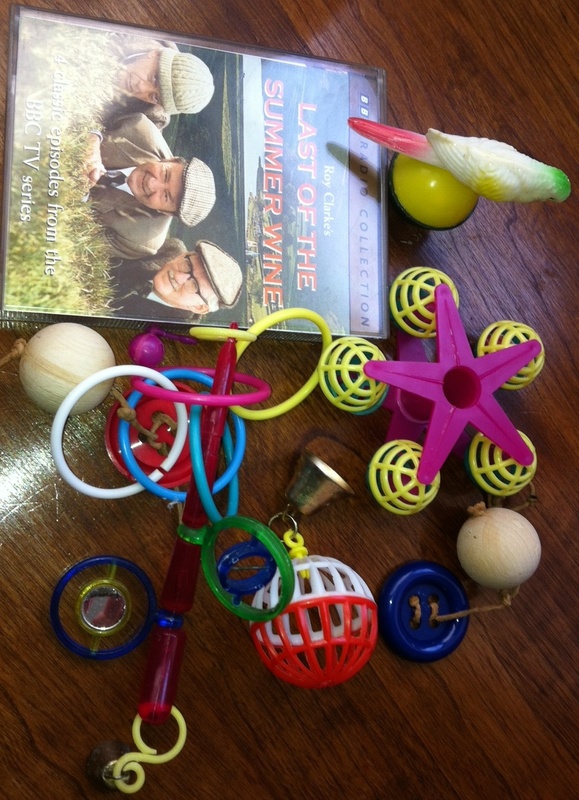 I mean – what kind of a rotten sod of an owner would give its little toys away….like… “Oh Chirpy! You’ve been such a bad boy headbutting your mirror every 5 seconds! I’m taking all of your toys down to the charity shop!” Haha. That would be really mean. Mind you – I do that with my own children actually – take their toys to the charity shop when they’re really naffing me off. or headbutting things. Haha! WOMAN: No. (not getting it). No-one would do that to a live budgie. I was thinking more of Bird Flu. Although like I said – we do wash everything here. Still. I don’t suppose your budgie will know that they used to belong to a dead budgie. They aren’t like dogs. They probably can’t tell through scent, or whatever. ME: Exactly. And if you think about it. I mean – I imagine that a lot of the clothes in this shop belonged….to people who are no longer with us. You know. WOMAN: I suppose. Not really thought about it before. Funny though. You having a budgie. Right old fashioned pet that, isn’t it? ME: Yeah. Everyone says that. But they’re very loving and chattier even than…. a husband can be. And you throw a blanket over them when they’re really annoying. You can’t do that to a fella, can you? Haha! WOMAN: (looking at the next items). Oooh – and …. did you realise that these are actually cassette tapes, love? They’re not CDs you know. ME: Yes. I always look for casettes. Was really chuffed when I spotted them. WOMAN: I didn’t even know we had any in the shop! So – how are you going to get them to work? ME: A tape recorder… We have three at home. Not counting the Walkman. WOMAN: Really? I don’t know anyone still using tapes. ME: We’ve got hundreds of them. Audiobooks mainly. But lots of 80s heavy metal and stuff like that. Even older actually. Beatles. Elvis… Actually – that’s the name of our budgie. Elvis. WOMAN: (chuckles) Elvis? Now that’s very old fashioned too! ME: (getting edgy now) Well, you know…they don’t write songs like they used to! WOMAN: Yes. My dad always used to say that. He died fifty years ago now and…And oh my Lord! You’ve got a Black Beauty audiobook! When’s the last time that was on the TV eh? 1978 at a guess! 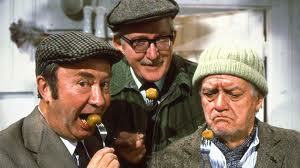 Oooh – and a Last of the Summer Wine audiobook here! ME: Well… we do live in Summer Wine territory. Nice to support out local economy and all of that. WOMAN: (giggling) You know, I’m only laughing because I’ve never really found it to be very amusing. Last of the Summer Wine, I mean. Do you? I mean – does it make you laugh? ME: I don’t … well. These tapes are for my daughter. WOMAN: Your daughter? How old is she? WOMAN: Ha! Well, righteo-then. That’ll be £4.25. Thanks. ME: Yeah, thanks. See you (heads for the door). WOMAN: (calls out) Yes – have a lovely day! Enjoy playing with your budgie toys and listening to your old cassettes! And so, dear chums – you will be relieved to hear that I was cured of my desire to SHOP. Whether in the brand spanking new classy sector, or in my usual comfort zone of the charidee shops. But what would he know? The man has no taste. 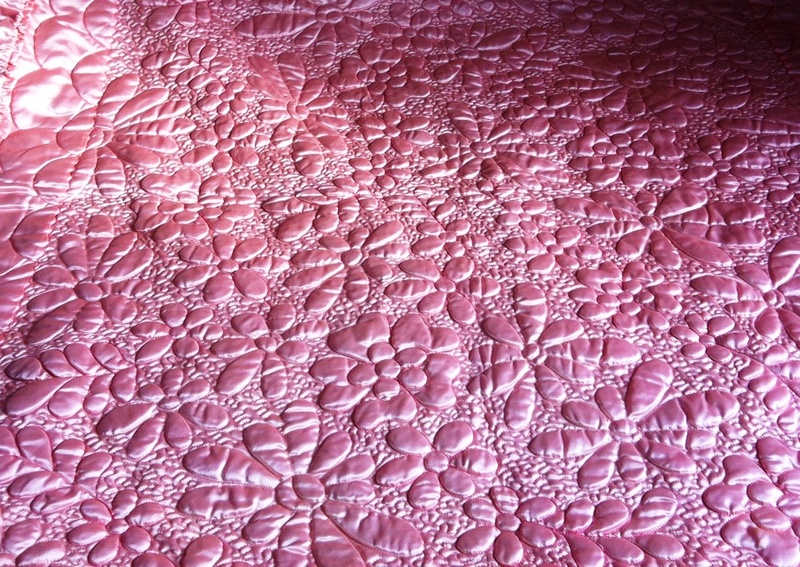 Even Joan Collins wouldn’t turn down her nose at some second-hand action on this lovely bedspread! Some readers of this blog will know that I don’t really do shopping. Well, high street shopping I mean. I hate the same blandness that 95% of the stores here in the UK represent these days. I despise the way that the big chains and the corporates assume that we’re a bunch of brainless, zombified sheep – sleep-walking our way to unecessary consumer tosh accruement and purchasing-oblivion. But this aversion to all things-high street extends to my other half. And the kids too. A suggestion of “let’s hit the shops” in my family is tantamount to saying “anyone fancy a bout of gastroenteritis this weekend?” So yesterday’s little excursion messed with my head somewhat. I visited a department store…. I know! 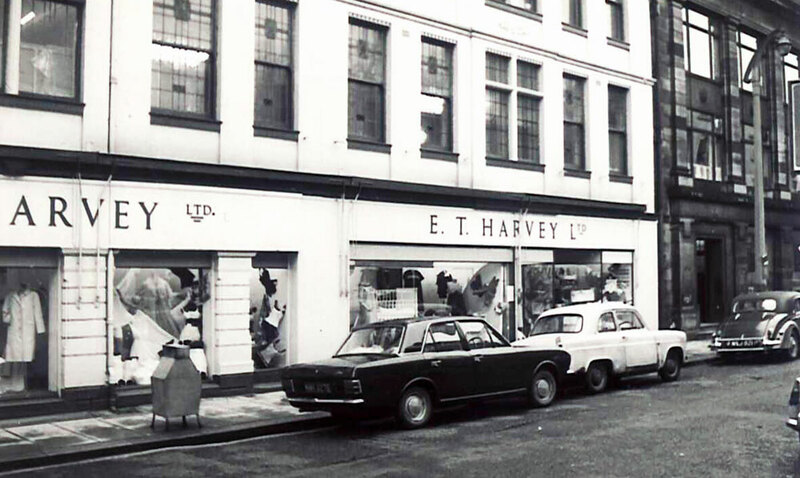 A business named ‘Harvey’s of Halifax’. So, I was all set to visit the shop. And okay, the plan was to just have a quick brew in their cafe. But I was initially impressed by the presentation of the building. And oh…dear, dear reader – if you are at all interested in urban design and heritage – you HAVE to check out Halifax for some stunning examples, the Piece Hall to begin with of course, as a ground-breaking bit of architecture. But Harvey’s building is also rather impressive. The business began back in the 1920’s. 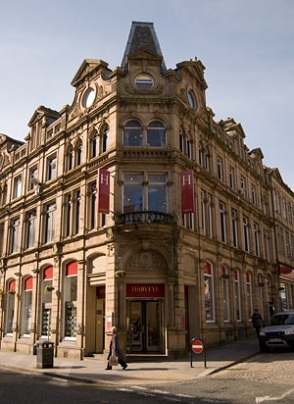 But today it stands proud – with three historical buildings merged – to form the modern-day Harveys. Although, I have to use the term ‘modern’ loosely – because the minute I stepped into the place I was catapulted back into the past. A reminder of that wonderful store named Lewis’ in Manchester. Many childhood memories of accompanying my Granny there via her Datsun Cherry (one of Granny’s first jobs back in the 30s was as a shop assistant in Lewis’). Immediately, I breathed in….what was it? Old World gentility. But not old-fashioned. No – it was far more upmarket than the Grace Bros (anyone remember ‘Are You Being Served?‘) Meaning that Harvey’s clearly rings those top class bells. But … without that sense of snootiness. Without making you feel that you can only shop there if you enjoy the feeling of Being Better Than Thou. So the place doesn’t possess the up-itself attitude of your Harvey Nicks. Sure, it’s enormous in size, but had been designed so that you didn’t feel too lost (although you probably were – if you were me – it happens to me a lot. I have a tendency to walk round ten square feet at least fifteen times without realising it.) The place was utterly bustling with what clearly were very loyal customers. But the bees-knees of this particular visit was when I learned about the charity work that Harveys are involved with. Again – none of your off the shelf corporate big charidee names stuff. 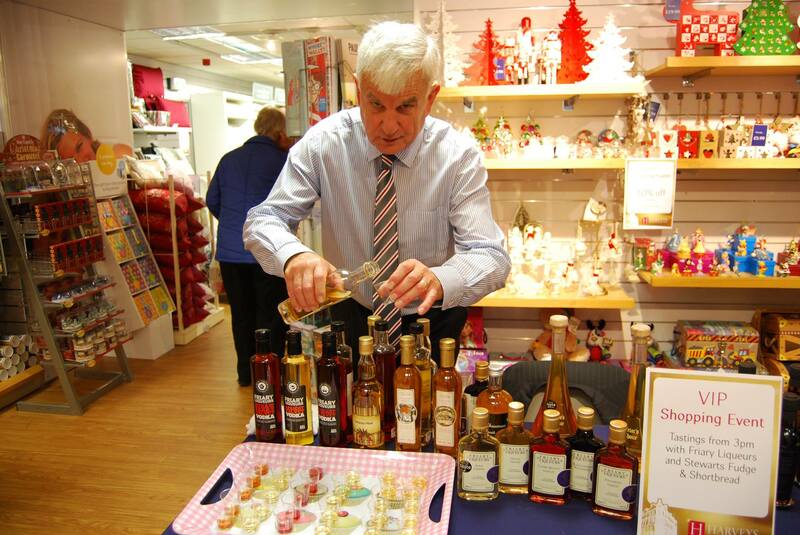 The store is heavily involved with a range of local charities and arts groups. Many of them being the smaller names that you may not be familiar with, but which (in my opinion) are more worthy of praise than the Big Guys in terms of bang for bucks. And real heart. Indeed, I happened to meet one of their latest recruits – a member of staff who had been part of a programme run by Halifax based charity ‘Project Challenge’ and who had been unemployed but was now working at Harveys and still dedicated to raising money for them.